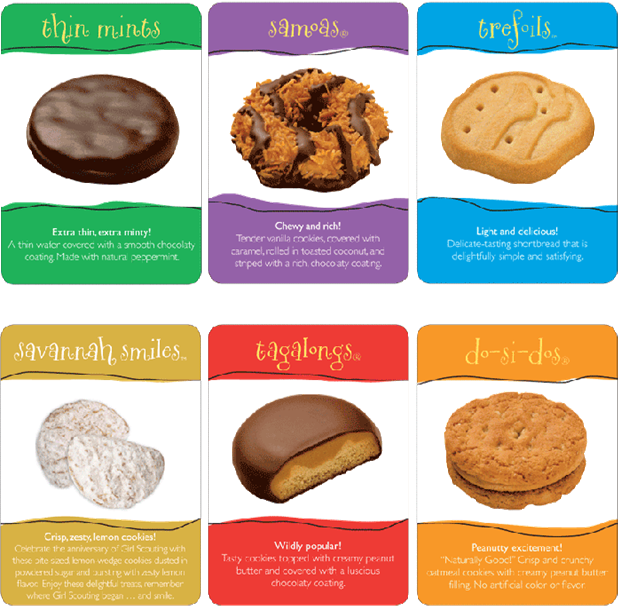 When you think about the Girl Scouts, what immediately pops into your head? Let’s be honest… you think cookies, right? 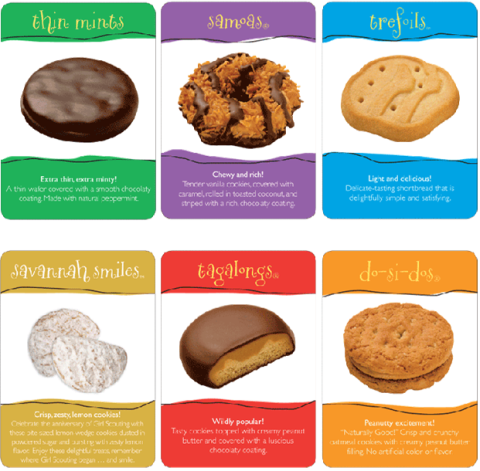 I mean, who doesn’t love those decadent Samoas or addictive Thin Mints? 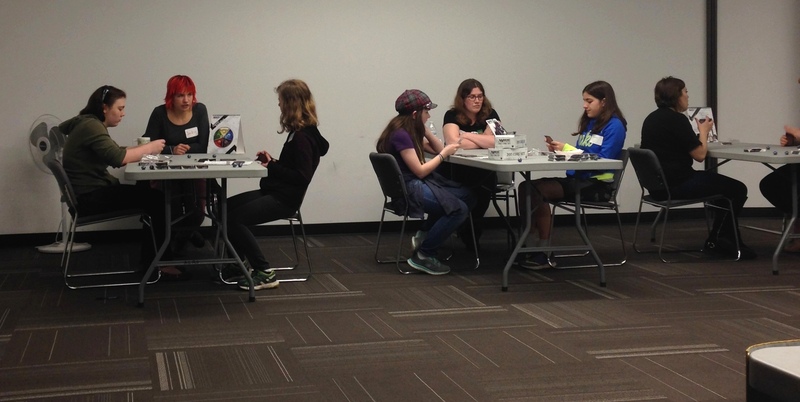 Back in November of 2014, our Gaming Events Coordinator, Andy Munich, was invited to represent GeekGirlCon in a 24-hour D&D marathon hosted by Dungeons & Dragons publisher Wizards of the Coast (WotC) to benefit Extra Life. During his eight-hour gaming stint, he struck up a conversation with Tammie Treibley Thompson, wife of WotC Senior Game Designer Rodney Thompson. 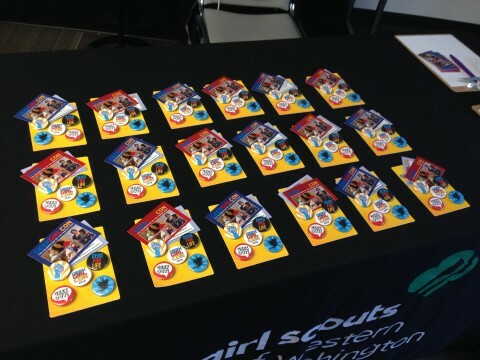 During their conversation, Andy learned that Tammie was a troop leader and as they continued to talk, they quickly realized that there was some synchronicity in their ideas–and the GeekGirlScouts were born! 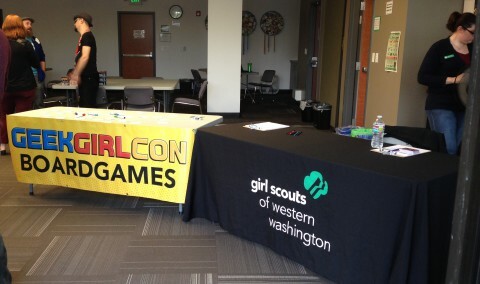 After several meetings, everyone agreed to co-host an evening of gaming at the Girl Scouts Headquarters in Bellevue, WA. The plan was simple: parents dropped off their children for a night of gaming. Parents could stay, but if they did, they had to play the same games that their kids played downstairs! Volunteers guided small groups of girls from pre-teens to teenagers through three separate areas of gaming. 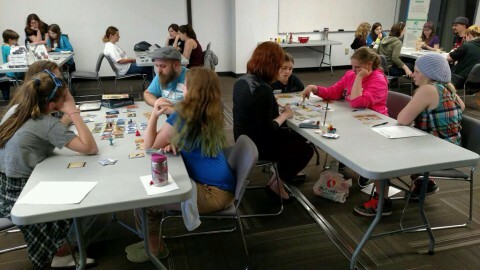 The selected games would introduce the participants to a cooperative board game (Forbidden Island), a tabletop RPG (Dread), and the fun of a strategic deck-building game (Magic: the Gathering). 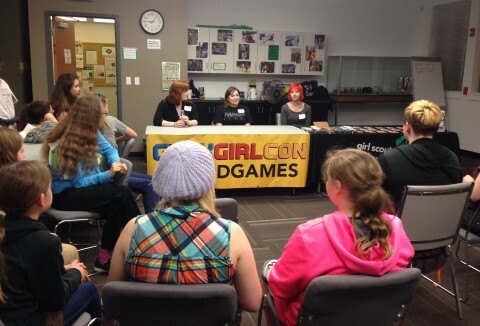 After the girls played the three different types of games, some of the volunteers would host a Q&A to answer questions about how they got into their various gaming-related careers. Tables set up for check in. Photo credit: Kristine Hassell. Our volunteer group was a mighty contingent from several local factions. From GeekGirlCon, Alyssa Jones (Manager of Gaming) and Mikey Brandt (Tabletop Games Manager) hosted the board game portion. Mikey explained Forbidden Island’s rules to attentive listeners. Photo credit: Kristine Hassell. Alyssa laid out the tiles for Forbidden Island. Photo credit: Kristine Hassell. 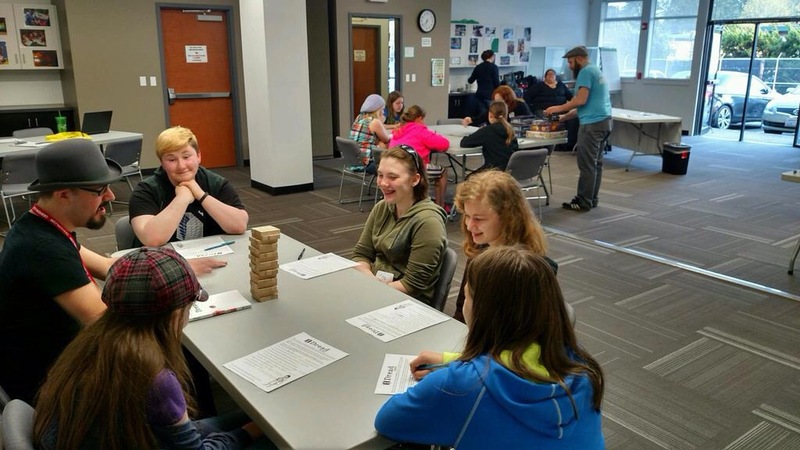 Andy Munich (Gaming Events Coordinator) helmed the RPG table and created three unique scenarios (medieval knights, superheroes, and vampire slayers) that were randomly assigned to his players. Andy was awestruck by a scout’s skill during Dread. Photo credit: Kristine Hassell. 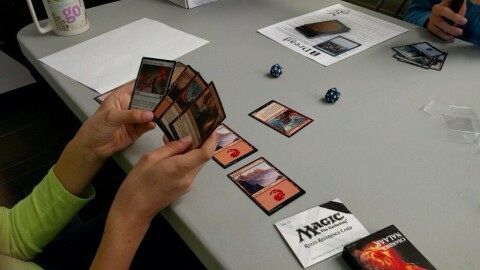 From WotC, Associate Game Designer and professional MtG player Jackie Lee and graphic designer and MtG player Liz Leo handled the MtG tutorials. 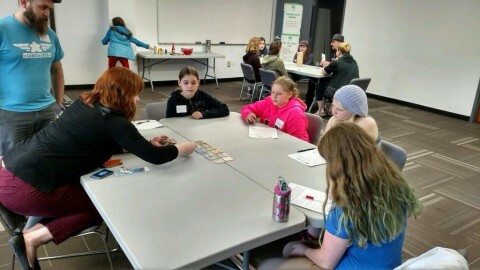 Desiree McCloud, also a Girl Scouts troop leader, lent her MtG skills as a representative of the Lady Planeswalkers Society, longtime supporters (and friends) of GeekGirlCon! From L-R: Jackie, Desiree, and Liz showed their tables what it was like to build a deck and then play. Photo credit: Kristine Hassell. A little MtG! Photo credit: Kristine Hassell. Alyssa and Mikey with their full tables for Forbidden Island. Photo credit: Kristine Hassell. The vampire hunters went awry! Photo credit: Kristine Hassell. I attended the event to live-tweet, take some photographs, and mostly observe the fun. It was fantastic to see the girls come out of their respective shells when they played the different games. Some of their attitudes shifted from cautious skepticism to wide smiles and laughter. 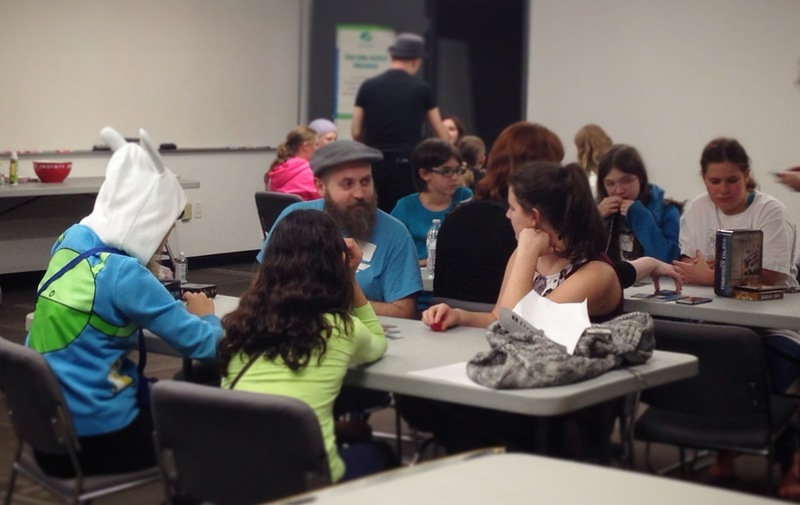 Hands down, one of the best things I overheard from Andy’s RPG table was a younger girl exclaim, “I’m going to punch that fish.” Trust me, in or out of context, it was an amazing thing to hear. Andy’s RPG table. No fish were harmed in the making of this blog post. Photo credit: Kristine Hassell. 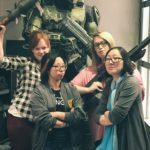 L-R Alyssa, Jackie, and Liz shared their love of gaming and answered questions about their careers. Photo credit: Kristine Hassell. As I finish writing this post, I am reminded of my own first gaming experiences and the fun that I during my years as a Girl Scout. Like Dr. Lee, I wished there was something like this when I was a kid but at the same time, I’m so excited to be a part of this golden age of gaming. In the last few decades, games of all varieties have skyrocketed in popularity. There are games for everyone and game nights are a great way to bring friends and family closer together. 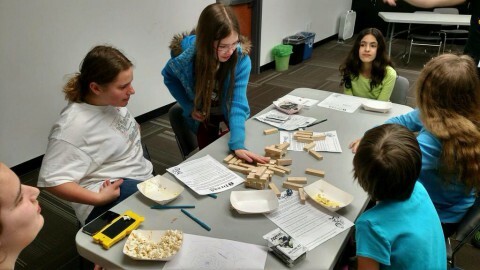 We know that games sharpen critical thinking skills because players are required to think on how to advance while adhering to the game’s rules. Board games and RPGs foster important social skills like teamwork, communication, and the patience of taking turns. Gamers learn how to plan ahead, strategize, and hone focus. You are attuned to what you’re doing and also what the other players are doing. You think on your feet, which can help you sort your way through problems and make decisions quicker. Creativity blossoms during RPGs and consider all the inventions that could come out of a simple RPG campaign when your intrepid character needs to figure a way out of a predicament. 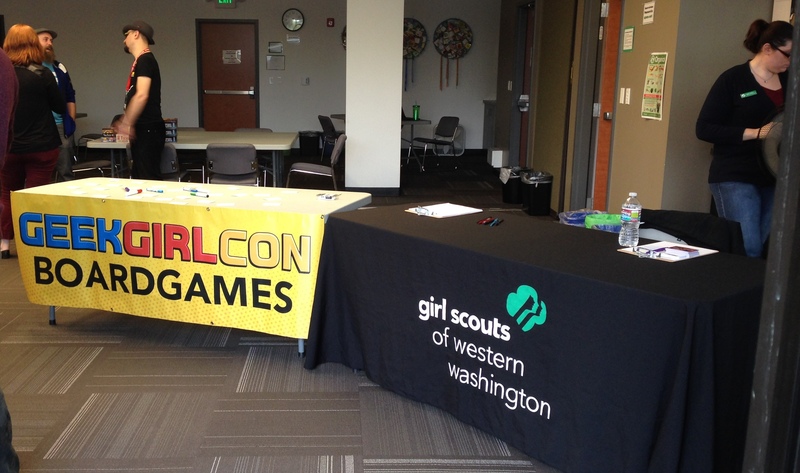 If you would like more information on how you can volunteer at GeekGirlCon or the Girl Scouts of Western Washington, don’t be shy! 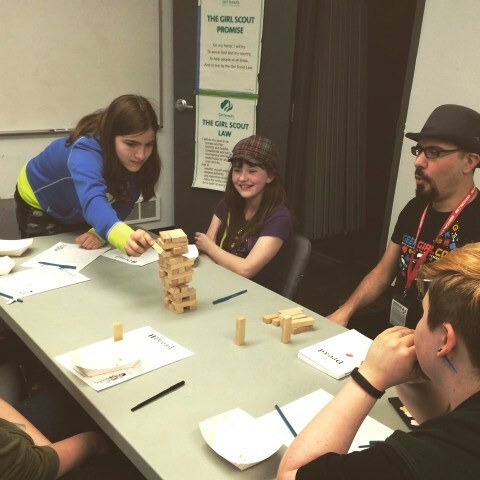 If you are simply keen to play some games in an inclusive space, join GeekGirlCon for our family-friendly board game nights at Wayward Coffeehouse! The game nights are absolutely FREE to all members of their Meetup group so sign up here and stop by for some great coffee and great games. You can also pick up passes for our fifth convention here, if you wanted to spend two whole days gaming… and why wouldn’t you?! 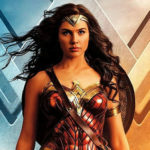 Join Us for a FREE Showing of Wonder Woman!